They are the stars of the school, the ones other students look to. They are the leaders and the role models, whether they chose to be or not, and their actions have a lasting effect on others. That was the message delivered to Warwick Valley’s varsity athletes at a special assembly sponsored by Orange County District Attorney David M. Hoovler. Former Titans quarterback Cody Hodges visited the High School to talk to the varsity athletes about their role as community leaders. The Uncommon Athlete program came to Warwick Valley High School on Oct. 12. Led by former Texas Tech and Tennessee Titans quarterback Cody Hodges, the presentation encourages young athletes to conduct themselves with integrity and be examples of courage, perseverance, and empathy. The program is part of Rachel’s Challenge, a non-profit organization which works to reduce bullying and violence in schools, and the Carl Ripken Sr. Foundation. 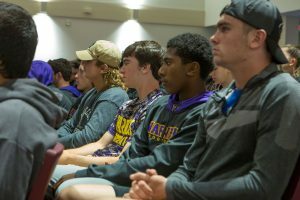 “People are watching you,” Hodges told the audience of athletes, many in their purple jerseys, “You have greater influence than you think. Every kid in the Middle School wants to be like you.” That’s why the athletes have a responsibility to do the right thing, to stand up for others, and to “be the type of person people can count on,” he said. Hodges encouraged the students to be leaders, not only on the field, but everywhere. Athletes from John S. Burke Catholic High School also attended the event, and Uncommon Athlete presentations have been held at high schools throughout Orange County this fall. 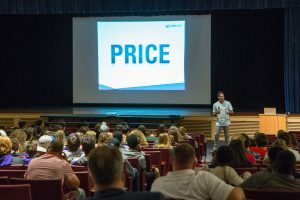 Hoovler, the county’s district attorney, said he began bringing the Uncommon Athletes program to the county’s schools three years ago because student athletes have a unique platform in their communities, and have the power to help schools in the fight against bullying. “When they show kindness and leadership it spreads to everybody else,” Hoovler said. Varsity players were reminded of their responsibility to their teammates and school community at the “Uncommon Athlete” assembly.